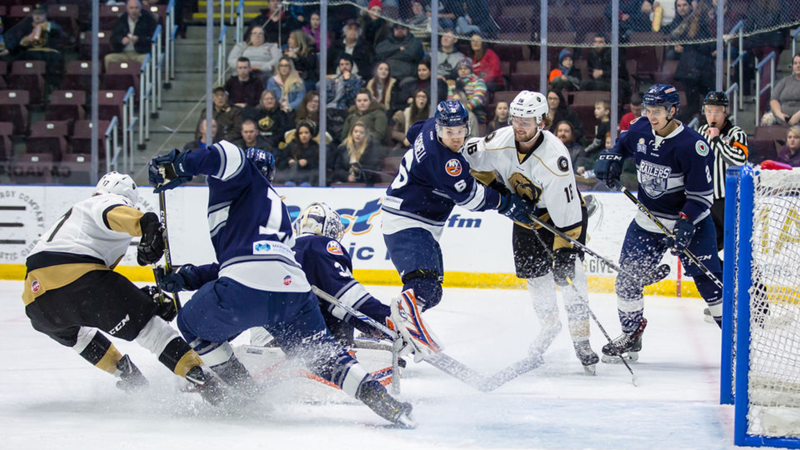 ST. JOHN’S, NFLD – The Worcester Railers HC (20-19-3-3, 46pts) wrapped up their three game Canada road trip with an dominating 5-1 win over the host Newfoundland Growlers (29-13-2-0, 60pts)in front of 5,116 fans at the Mile One Centre on Saturday evening. The Railers host a 3-in-3 PINK in the RINK weekend at the DCU Center beginning on Friday, February 8 on a 2-3-4 Friday on 80’s Night presented by WXLO. Josh Holmstrom (1-1-2), Matty Gaudreau (1-2-3), Tyler Barnes, Yanick Turcotte, and Ryan Hitchcock all scored for Worcester while Mitch Gillam made 25 saves in net for his 13th win of the season. Michael Garteig made 20 saves in net in the loss for the Growlers as Worcester improved to 8-12-0-2 on the road this season. It was the first win in four tries at the Mile One Centre for the Railers as Worcester also scored their first two shorthanded goals of the season (Barnes and Hitchcock) as the Railers finished the three game Canada road trip 1-1-0-1. The Railers played a terrific first period and scored at 1:36 as Josh Holmstrom (10th) slid home a score at the side of the net after great tic-tac-toe passing by Matty Gaudreau and Nick Sorkin. Shots were 9-8 in favor of Newfoundland as Mitch Gillam stood tall in net as Worcester took a 1-0 lead into the first intermission. The Growlers tied the score at 1-1 with a breakaway score just 40 seconds into the second frame as Marcus Power (16th) beat Mitch Gillam with a backhander. But Worcester recovered nicely and controlled most of the second period as Matty Gaudreau (8th) banked a puck off netminder Michael Garteig from behind the goal line and into the net at 10:45 to give the Railers a 2-1 edge. Tyler Barnes (16th) scored the Railers first shorthanded goal of the season as he used Tommy Kelley as a decoy on a 2-on-1 and zipped a wicked shot top shelf at 16:08 to give Worcester a 3-1 advantage through 40 minutes. Shots were 19-15 in favor of Worcester through two periods of play. Yanick Turcotte (2nd) provided an insurance goal at 3:41 of the third period assisted by Mike Cornell and Tommy Kelley to give Worcester a 4-1 lead. Ryan Hitchcock (6th) scored the second shorthanded goal of the night for Worcester on a breakaway at 9:12 to end the scoring for both sides. A large skirmish broke out in the final seconds as the Railers took home the 5-1 road victory in St. John’s. Notes: Three Stars: 3rd star: Mike Cornell (0-1-1) 2nd star: Josh Holmstrom (1-1-2) 1st star: Matty Gaudreau (1-2-3) …. final shots were 26-25 in favor of Newfoundland…. Michael Garteig (17-10-1) made 20 saves on 25 shots for Newfoundland.…. Mitch Gillam (13-11-2) made 25 saves on 26 shots for Worcester while Evan Buitenhuis was the backup….Worcester went 0-for-4 on the power play while Newfoundland went 0-for-5…. Kyle McKenzie (inj), Woody Hudson, Bo Brauer, Tyler Mueller (inj), and Malcolm Gould (inj) did not dress for Worcester…. Jeff Kubiak is on recall with the Bridgeport Sound Tigers… Tyler Barnes now has a six-game point streak (5-3-8) and has set a Railers record with goals in four straight games….the Railers were the only team in the ECHL without a shorthanded goal before Barnes scored one in the second period…..Ryan Hitchcock has six assists in his last three games (1-5-6)…. the Railers finished 1-3-0-0 at the Mile One Centre….Ryan MacKinnon also added an assist….the two teams combined for 68 penalty minutes…the Railers are 3-0-0-0 all-time when Turcotte scores a goal…. Turcotte had a game high four shots and 14 penalty minutes…it was the first time this season the Railers scored five goals on the road this season. What’s on tap – PINK IN THE RINK WEEKEND AT DCU CENTER! On Friday, Feb 8 the Railers host the Greenville Growlers on a 2-3-4 Friday on 80’s Night presented by 104.5 FM WXLO. Enjoy $2 popcorn, $3 soda, and $4 Bud Lights in the Bud Light Lounge. Individual tickets start as low as $15 by calling 508-365-1750 or visit RailersHC.com. Save $$$ with a RAILERS 6 PACK which includes six flex tickets and a Railers winter hat starting at $99. On Saturday, Feb 9 the Railers host the Wheeling Nailers at 7pm on a BIG GAME SATURDAY on PINK IN THE RINK presented by Ramco Construction and JLA Contracting! The Railers will wear a special pink jersey to benefit the Cup Crusaders as the DCU Center ice will be painted pink to raise awareness for breast cancer! Every Saturday night home game is SATURDAY NIGHT SIGNINGS presented by MidState Auto Group with a Railers player signing autographs during the first intermission. Tickets start at just $15 by calling 508-365-1750! On Sunday, Feb 10 the Railers host the Cincinnati Cyclones on a KIDS GIVEAWAY SUNDAY! The first 1,000 kids 12-and-under will receive a voucher for a free game of laser tag at APEX Entertainment Complex. Celebrate TRAX’s birthday as several mascots will be on hand to wish TRAX a happy birthday. Members are encouraged to stick around after the game for amembers only postgame skate with the Railers players presented by Northern Bank! Score a SUNDAY FUNDAY ticket pack which includes 4 ticket and 4 beers or 4 tickets and 4 sodas/popcorns starting at just $60!